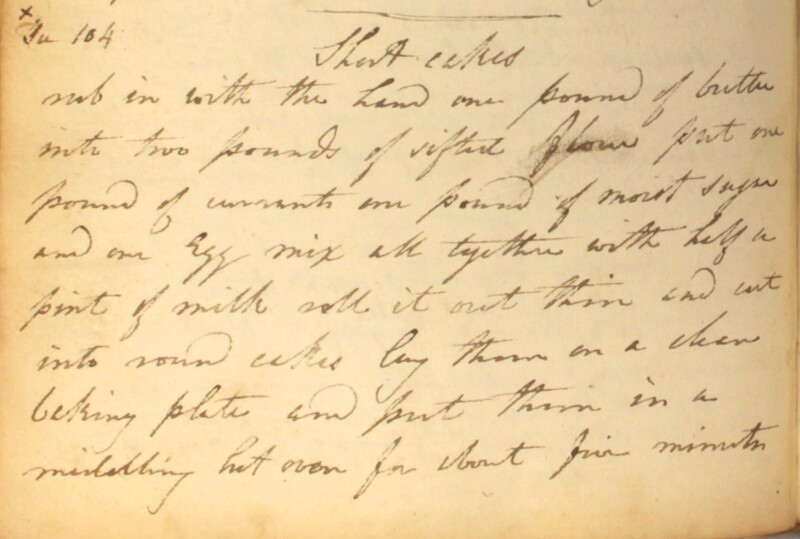 This nineteenth-century recipe for shortcake biscuits translates well to the modern kitchen. Rub together the flour and butter, sweeten with soft brown sugar and add currants for flavour. Combine with a beaten egg and milk and then bake in the oven for a simple but tasty teatime treat! Rub in with the hand one pound of butter into two pounds of sifted flour. Put one pound of currants, one pound of moist sugar and one egg. Mix all together with half a pint of milk, roll it out thin and cut into round cakes. Lay them on a clean baking plate and put them in a middling hot oven for about five minutes. There’s no doubting the freshness of this cheese: the recipe specifies that the milk should be taken “as hot as possible from the cow“! It is another indication that our unknown ladies kept their own cattle. Take 36 qrts of milk as hot as possible from ye cow. Put it in ye churn which must be made hot with boyling water before you put ye milk in it. Churn it as you do butter & as long as any butter will come. 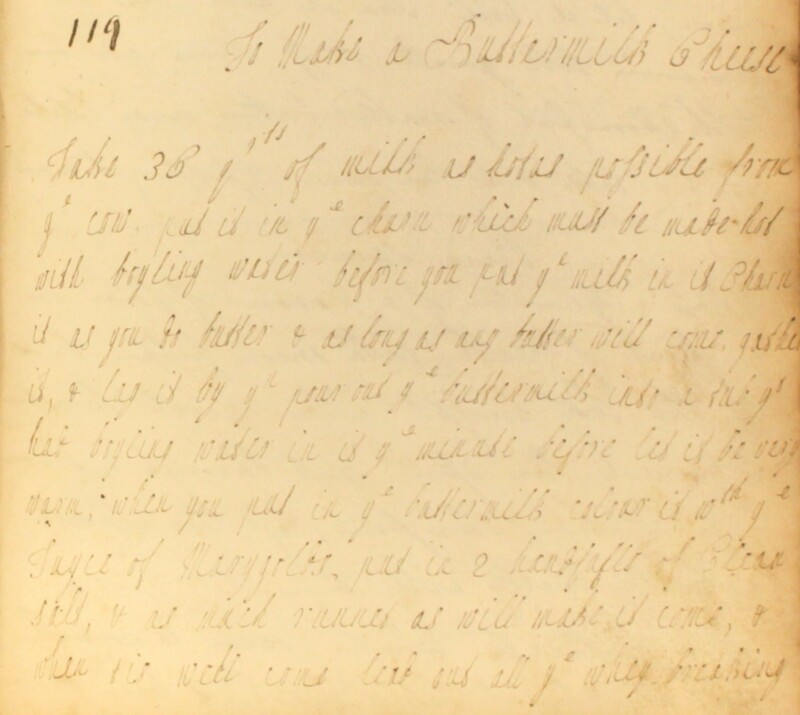 Gather it & lay it by, yn pour out ye buttermilk into a tub yt had boyling water in it ye minute before. Let it be very warm. 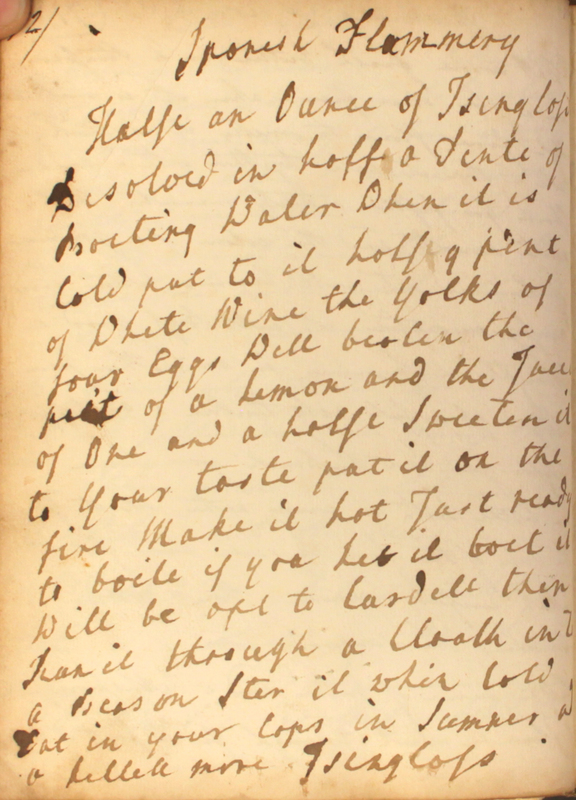 When you put in ye buttermilk, colour it wth ye juyce of marygolds. Put in 2 handfulls of clean salt & as much runnet as will make it come, & when tis well come, lead out all ye whey, breaking ye curd as small as possible. Put it into ye fatt, which must be larger a good deal what it will require when tis fininsh’d. Besure press out ye whey with yr warm hands very well. When you have put in all ye curd into ye fatt, put it into ye press & give it half a dozen turns to get out all ye whey. Then, take it out of ye fat, slice it & cut it like minc’d meat. Then pour warm water on it. Mix it quick with yr hands & pour of ye water as fast as you can, which will bring out a great deal of ye grease & whey. 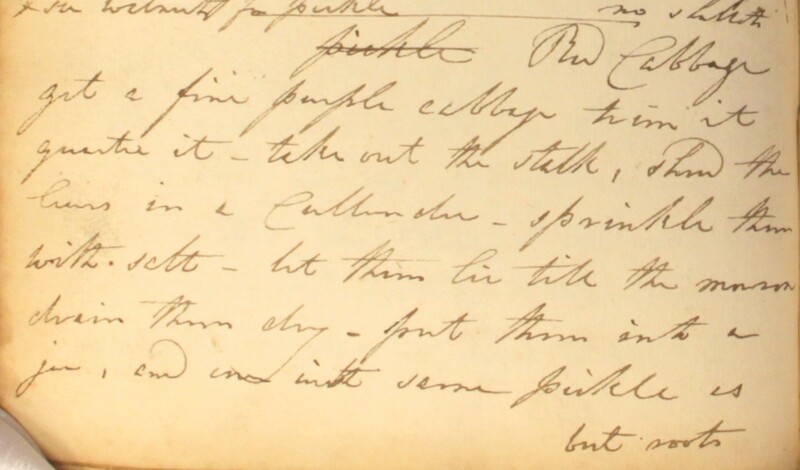 Then work ye butter you took of ye churn into ye curd very well & then put it into ye fatt, & so into ye press, turning it often with care, & often changing ye cloths. Let it remain in ye press till next day. Then, take it out of ye fatt & rub it wth salt. Let it stand in a dry place, turnning it & wiping it every day with care. Ye fatt must be a quarter & an half deep & a quarter wide. 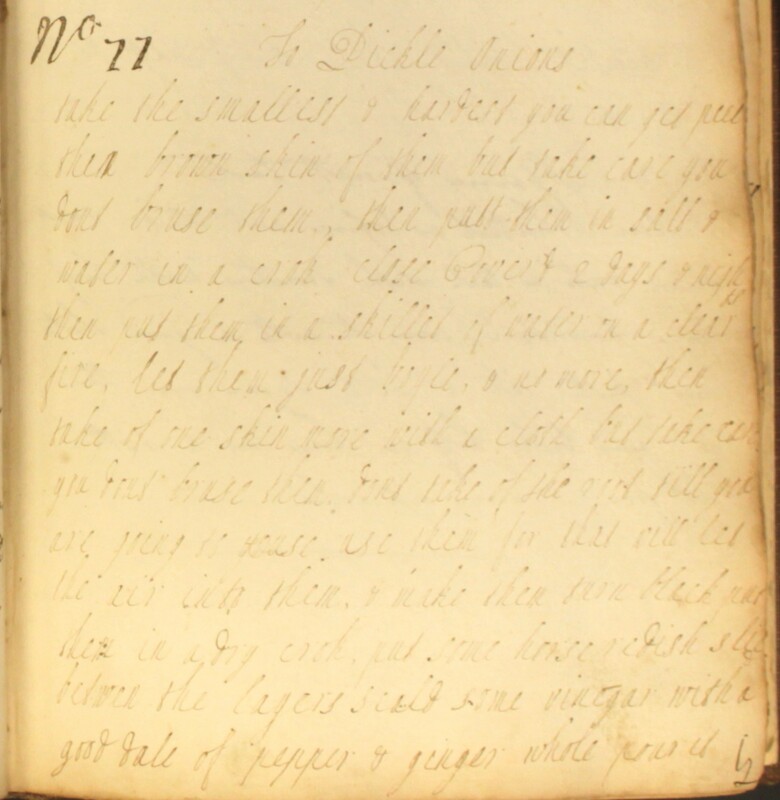 This recipe for a lemon sponge offers a good insights into the level of physical exertion demanded of kitchen staff in the Georgian era. 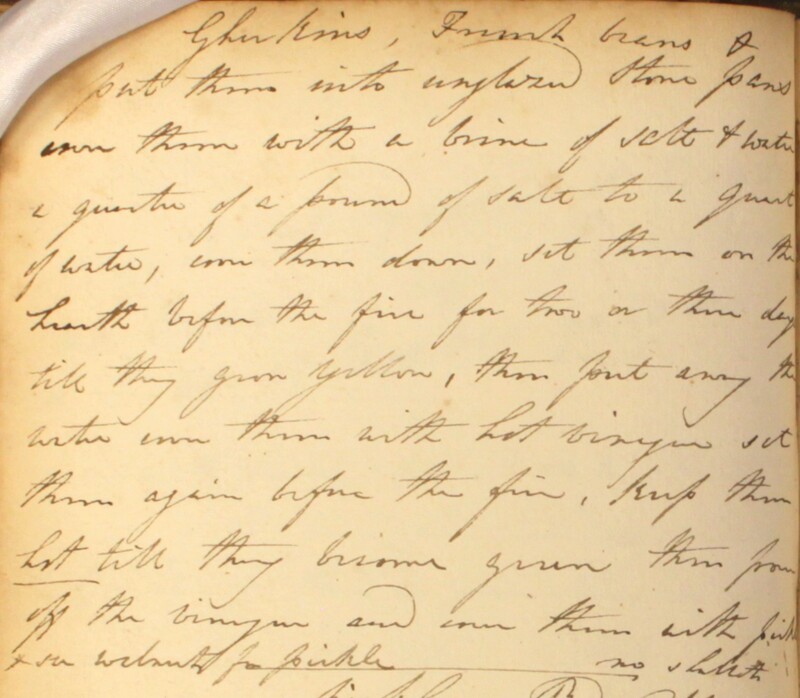 As the only raising agents in the recipe, the eggs needed to be whisked with sugar for an hour to incorporate sufficient air into the cake mix. And then there are the almonds, which were to be pounded down into a paste with rosewater before being combined with the other ingredients. The whole process is made all the more cumbersome because of the large quantities involved. There are 3lbs (1.36 kg) of dry ingredients alone, without factoring the astonishing number of eggs required. Take 16 eggs, half the whites, a pd & half of dubble refind sugar. Put yr eggs & sugar together & whip them for an hour till as white as cream. 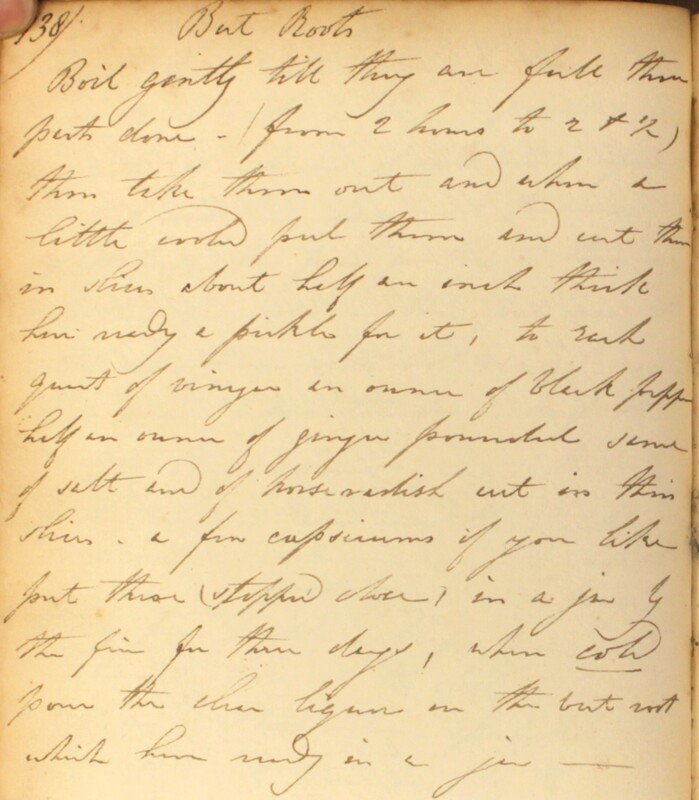 Then put to it a nagin of rose water or orange flower water & the out side rind of 4 lemons greated, 1 pd of fine flower dryed, half a pd of Jordon almonds with rose water. Mix all well together with a whisk. Put paper in the pan. Put it quick in the oven. An hour and a qr bakes it. Barley water has been closely associated with the Wimbledon Championships since 1934, when Robinsons became the official supplier of its still soft drinks. Two ounces of pearl barley washed clean in cold water. Put it into half a pint of boiling water and let it boil five minutes. Pour off this water and add to it two quarts of boiling water. Boil it to one quart and strain. The following addition makes it an agreeable drink. 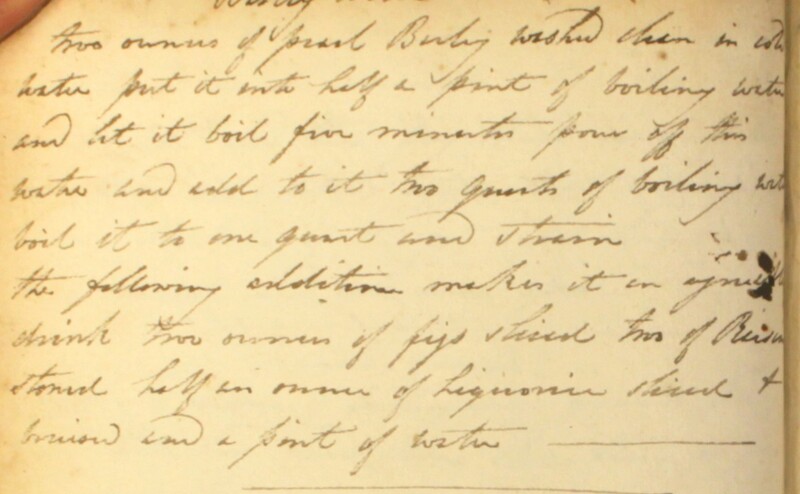 Two ounces of figs sliced, two of raisins stoned, half an ounce of liquorice sliced & bruised, and a pint of water. The English word flummery comes from the Welsh llymru. During the 1600s, the popularity of this cold oatmeal pudding spread to the English counties, and versions of it were famously eaten in Cheshire and Lancashire. Halfe an ounce of isinglass disolved in half a pinte of boiling water. When it is cold, put to it half a pint of white wine, the yolks of four eggs well beaten, the peel of a lemon and the juice of one and a halfe. Sweeten it to your taste, put it on the fire. Make it hot, just ready to boile. If you let it boil, it will be apt to curdell. Then run it through a cloath into a beason. Stir it whin cold. Eat in your cups. In sumner add a littell more isinglass. 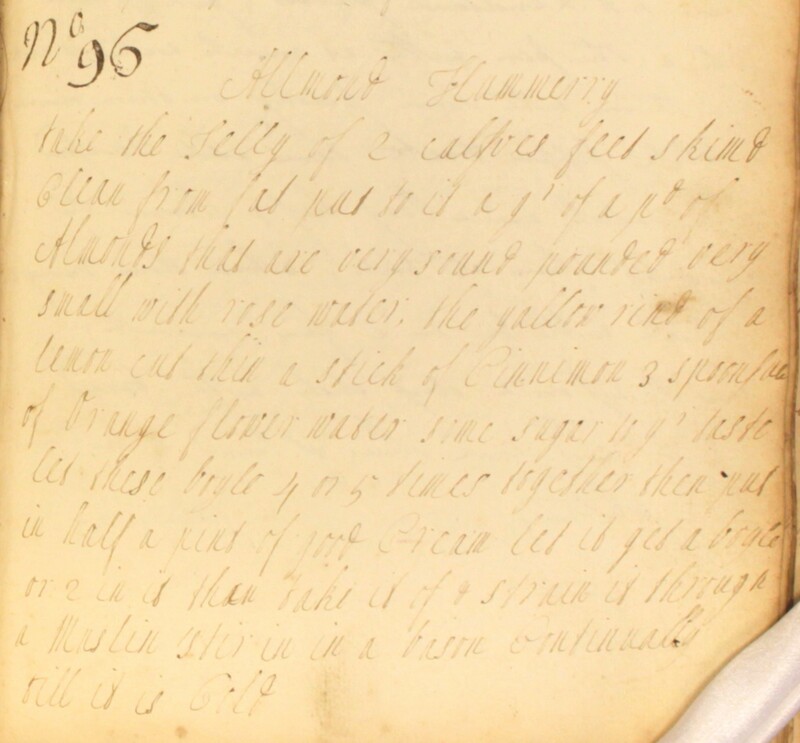 This 18th century flummery is flavoured with almonds and set with calf foot jelly. Take the jelly of 2 calves feet skimd clean from fat. Put to it a qr of a pd of almonds that are very sound pounded very small with rose water, the yallow rind of a lemon cut thin, a stick of cinnimon, 3 spoonfull[s] of orange flower water, some sugar to yr taste. Let these boyle 4 or 5 times together, then put in half a pint of good cream. Let it get a boyle or 2 in it, then take it of & strain it through a muslin. Stir it in a bason continually till it is cold. As fresh produce burst forth from small-holdings and gardens during the summer months, Regency cooks had to cope with a constant stream of fruit and vegetables coming into the kitchen for preservation. Put them into unglazed stone pans. Cover them with a brine of salt & water, a quarter of a pound of salt to a quart of water. Cover them down. Set them on the hearth before the fire for two or three days till they grow yellow. Then put away the water, cover them with hot vinegar, set them again before the fire. Keep them hot till they become green. Then pour off the vinegar and cover them with pickle*, no shallots. Boil gently till they are full three parts done – from 2 hours to 2 & ½. Then take them out and, when a little cooled, peel them and cut them in slices about half an inch thick. Have ready a pickle for it, to each quart of vinegar an ounce of black pepper, half an ounce of ginger pounded, same of salt and of horseradish cut in thin slices, a few capsicums if you like. Put these (stopped close) in a jar by the fire for three days. When cold, pour the clear liquor on the beet root, which have ready in a jar. Get a firm purple cabbage. Trim it, quarter it, take out the stalk. Shred the leaves in a cullender. Sprinkle them with salt. Let them lie till the morrow. Drain them dry. Put them into a jar and cover with same pickle as beet roots. Come early summer, thoughts turn to how best to preserve the produce of the season. In the Georgian period only the wealthiest households would have had an ice house for rudimentary refrigeration. Most domestic cooks needed to resort to other methods – such as salting and pickling – to ensure that the plethora of fresh produce did not go to waste. The strongest vinegar should be used for pickling. It must not be boiled or the strength of the vinegar & spices will be lost. By parboiling the pickles in brine, they will be ready in half the time. When taken out of the hot brine, let them get cold and quite dry before you put them into the pickle. To assist the preservation, add a portion of salt. For the same purpose, and to give flavor: long pepper – black pepper – white pepper – allspice – ginger – cloves – mace – garlick – mustard – horseradish – shallots – capsicum. The best method is to bruise in a mortar three or four ounces of the above materials. Put them into a stone jar with a quart of the strongest vinegar. Stop the jar closely with a bung. Cover that with a bladder soaked with pickle. Set it on a trivet by the side of the fire for three days, well shaking it up three or four times a day. By pounding the spice, half the quantity is enough and the jar being well closed and the infusion made with a mild heat, there is no loss by evaporation. Run a larding pin through the articles pickled to give them the better flavour. A wooden spoon full of holes to take them out. Take the smallest & hardest you can get. Peel their brown skin of them but take care you dont bruse them. Then putt them in salt & water in a crok, close cover’d, 2 days & nights. Then put them in a skillet of water on a clear fire. Let them just boyle & no more, then take of one skin more with a cloth but take care you dont bruse them. Dont take of the root till you are going to use them, for that will let the air into them & make them turn black. Put them in a dry crok. Put some horse redish slic’d betwen the layers. Scald some vinegar with a good dale of pepper & ginger whole. Pour it scalding hot on them. Cover them close immediately. Keep them always close cover’d with a blader & leather. You must not expect them to keep above 2 months rightly white. They may be done any time of the year.